This smell can quickly be transferred to your newly laundered items, making them smell just as bad. That’s why it is so important to take the time to learn how to clean a dryer the right way, so your recently washed clothes stay clean. The drum in your dryer can be coated with chemicals or even an oily residue that can be transferred to your clothing in the process of drying. Another reason you need to take the time to clean your dryer on a regular basis is to remove the dryer lint that builds up over time. Doing this will not only help you save on electricity, but it will also reduce the risk of fire. Routine cleaning of your dryer merely means removing the lint from the dryer lint trap after every load, checking the dryer drum every quarter, and cleaning the dryer vent regularly. You can start by unplugging the machine and pulling it out from the wall. Using a microfiber cloth and the following homemade all-purpose cleaning spray, clean the exterior of the device. Be sure to clean the knobs and buttons, as grime and dust tend to build-up on these areas. In a medium-sized bowl, add the water and stir in the baking soda until dissolved. Add the white vinegar and lemon juice. Continue to stir constantly for one minute until the foaming subsides. Add the lemon essential oil and wait five minutes. Stir the mixture again. When the solution has stopped fizzing, pour it into a spray bottle. Before each use, gently swirl the spray bottle to recombine the ingredients. Once you’ve cleaned the exterior of the dryer, you can move on to sweep the interior parts that are immediately accessible. 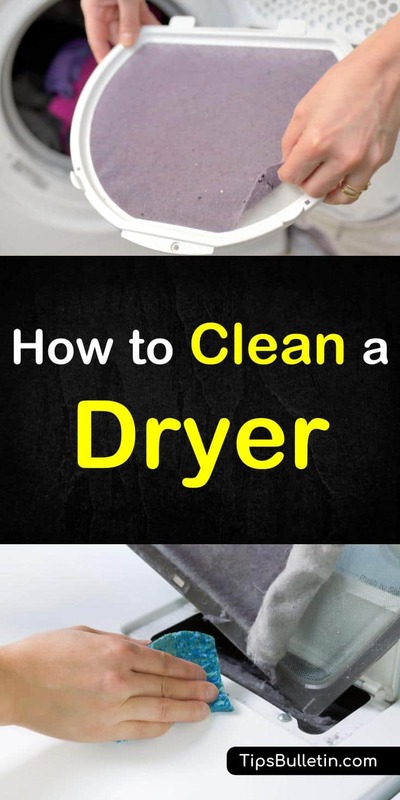 Especially after you use your dryer on delicate fabric like after washing a down comforter or drying a pillow, start by removing the lint trap and washing it in the sink with warm, soapy water. Allow this to air dry while you move to clean the dryer drum. Carefully inspect the drum and remove any threads, pieces of tape and other items that might have become stuck in the fins of the dryer drum. If there are spots that are greasy, you can rub them with warmed olive oil and scrape them away with a spatula. Once you’ve removed these messes, you can spray the inside with the all-purpose cleaner. The lint that builds up inside the cabinet of the dryer has resulted in more than 15,000 fires every year. Whether you realize it or not, the lint in your dryer can escape to other parts of the machine through the tiny gaps around the edges of the dryer drum. The lint can fall into the cabinet of the dryer, especially when the exhaust vent or cap is clogged, resulting in restricted airflow. The heating elements of the dryer can then ignite the lint. The flames can then travel through the lint-lined exhaust vent and spread to the rest of the home. If your dryer’s lint filter is on the top, you’ll need to first, unplug the dryer, then remove the screws from under the dryer lint filter. Next, pull the top forward and lift in order to release the top from the catches that you can find at the corners. Next, you’ll need to take the front panel of the dryer off, by removing the two screws located near the top of the board, then tip the front of the panel forward and lift it to clear the bottom catches and drum. Once you remove the top and front panel, use a dryer brush to remove the lint from the lint filter opening. 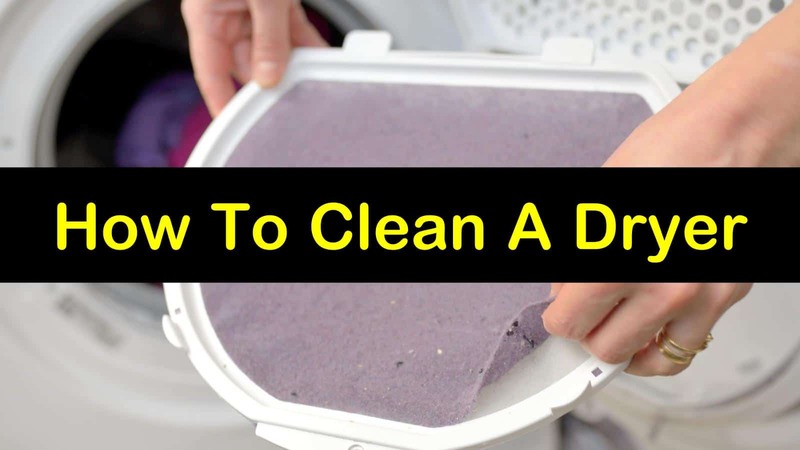 Use a vacuum to remove any loose lint from around the dryer drum. Be sure to thoroughly clean around the heating elements, gently working around the mechanical parts and the wires. Finally, reassemble the dryer. Start by putting the front panel back into the drum, lifting it carefully and dropping the front into the bottom catches, keeping the panel tight against the sides. Replace the front screws and wires and place the top back down, reattaching the screws under the dryer lint filter. If your dryer has a removable front access panel, you’ll need to release the metal catches to remove the panel. You can do this by sliding a screwdriver between the gap at the top of the bottom panel. Use the screwdriver to press down on the two catches at either side of the panel. Carefully vacuum around the vent, motor, and the inside of the dryer. Be careful when cleaning around the small parts and wires to avoid breaking them. When you’ve vacuumed up all the lint, you can replace the front panel by sliding it back into place. If your dryer is taking longer than normal to dry your clothes, and the outside of the dryer gets extremely hot during a cycle, it might be time for you to perform dryer vent cleaning to prevent the dangers of excessive lint build-up. You’ll want to gather the following tools when cleaning a dryer vent. To start cleaning the vents in your dryer, you need first to remove and clean the lint trap filter. Next, use the vacuum to clean the inside of the lint trap housing. After using the vacuum, make a second pass with the long flexible brush that comes with the brush kit. Make sure you extend the brush to the bottom of the cavity. Gently twist the brush to gather the clumps of lint at the bottom of the trap. Remove the brush and clean the bristles with the vacuum. Repeat the process until you aren’t able to remove any more lint from the cavity. Next, you’ll want to unplug the dryer and turn the gas valve off if you have a gas dryer. Disconnect the duct joint that is closest to the dryer and gently pull the dryer away from the wall. Then, disconnect the remaining sections of the dryer duct. Using the round duct brush from the kit, insert it into each part of the exhaust vent and sweep it clean using a rotating motion while moving the brush back and forth. Frequently wash the head of the brush to avoid placing lint back into the duct. Continue cleaning the remainder of the duct using the same technique, until no more lint comes out of the vent hose. You’ll also want to check the vent cap on the exterior of the vent pipe to make sure it is clean and in proper working order. Finally, replace the duct sections and reassemble the dryer. If you have kids or are a bit forgetful, you may end up finding melted gum in your dryer, resulting in loads of laundry being ruined and streaked with a sticky residue. If you’ve discovered melted gum in your dryer, here is how you can quickly clean up the mess. Start by thoroughly saturated a dryer sheet with water and placing it over the gum. Allow standing for 15 minutes. After 15 minutes, scrub the gum with the dryer sheet to remove any traces. The longer you allow the dryer sheet to soak the gum, the easier it will be to remove. To avoid making a bigger mess with the loosened gum, be sure to scrub over a small surface. Next, pour fabric softener over the dryer sheet and place over any stubborn residue that you couldn’t immediately remove. Allow the cloth to stand for 30 minutes, then scrub the remaining gum with the dryer sheet. Finally, clean the inside of the dryer with the all-purpose cleaner to ensure you remove any remaining residue. The best way to prevent your clothes dryer from catching fire is to ensure it is cleaned on a regular basis and adequately maintained. If you take the time to empty the lint trap after every load, you’ll keep your dryer running well between regular cleanings and will allow you to be deep clean the dryer in less time. We hope you enjoyed learning how to clean a dryer. If you found the information in this article helpful, please share it with your family and friends.